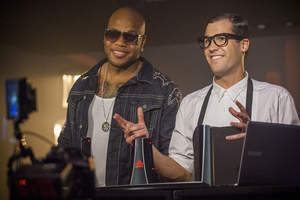 October 31, 2013 08:31 ET | Source: Beamz Interactive, Inc.
Beamz Interactive today announced the launch of brand new commercial testing on national cable TV featuring current chart topping hip-hop artist, Flo Rida. The updated commercials will also appear on www.BeamzbyFlo.com, and/or select internet channels. SCOTTSDALE, AZ--(Marketwired - Oct 31, 2013) - Beamz Interactive, Inc. (OTCQB: BZIC), an emerging growth technology company specializing in state-of-the-art interactive music products, today announced the launch of brand new commercial testing on national cable TV featuring current chart topping hip-hop artist, Flo Rida. The updated commercials will also appear on www.BeamzbyFlo.com, and/or select internet channels. The latest commercial testing features Flo Rida demonstrating the Beamz by Flo product line in a direct-to-consumer offer that allows viewers to purchase this innovative interactive music device and technology, now available for shipment. The new and improved commercials are expected to be accessible to potentially millions of viewers, launching on networks such as MTV, VH1, Bounce and Comedy Central, starting with a test program commencing this weekend. "We are excited to launch of our latest TV commercials featuring hip-hop star, Flo Rida," said Charlie Mollo, CEO of Beamz Interactive. "Beamz by Flo is an ideal product for this type of broad-based awareness campaign. Showcasing our product on networks such as MTV, VH1 and Comedy Central is a perfect way to reach our target audience of 18-35 year olds, including self-described music fans. We are looking forward to encouraging a new generation of music enthusiasts to experience the latest trend of interactive music technology in cities across America." With over 100 million subscribers on MTV and VH1 alone, the company believes it is targeting an ideal set of music entertainment networks to promote Beamz by Flo. In addition, management expects Bounce and Comedy Central to air the latest commercials for what is anticipated to be an exciting launch on some of the most viewed networks on cable television. Based on the results of the latest test programs, Beamz will make adjustments to enhance its marketing and strategic awareness initiatives before its final TV commercial debut closer to the 2013 holiday season. Through the company's partnership with Flo Rida, the "Beamz by Flo" product line features Flo Rida's latest songs and chart-topping hits. Flo Rida was recently named a Billboard Top 100 Artist for 2012 and is the best-selling digital hip-hop artist in the world, with over 600 million video views on YouTube. His latest single "Can't Believe It" features Pitbull, and has been ranking high on the international iTunes hip-hop charts. This press release may contain forward-looking statements that reflect the Company's current expectations and projections about future results, performance, prospects and opportunities. These forward-looking statements are based on information currently available to the Company and are subject to a number of risks and uncertainties. The Company's actual results could differ materially from those anticipated in these forward-looking statements as a result of a variety of factors, including those discussed in the Company's periodic reports that are filed with the Securities and Exchange Commission and available on its website (www.sec.gov). All forward-looking statements attributable to the Company or persons acting on its behalf are expressly qualified in their entirety by these factors. Other than as required by law, the Company assumes no obligation to update publicly or to revise these forward-looking statements.